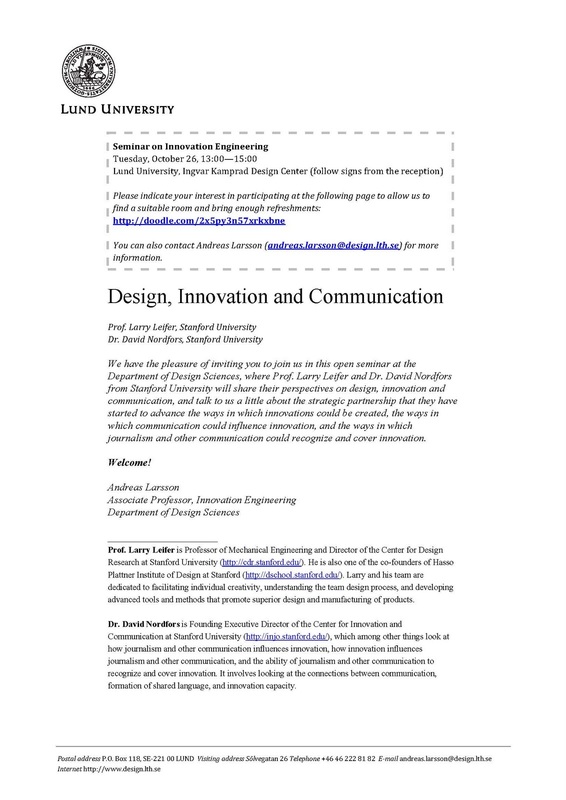 We have the pleasure of inviting you to join us in this open seminar at the Department of Design Sciences, where Prof. Larry Leifer and Dr. David Nordfors from Stanford University will share their perspectives on design, innovation and communication, and talk to us a little about the strategic partnership that they have started to advance the ways in which innovations could be created, the ways in which communication could influence innovation, and the ways in which journalism and other communication could recognize and cover innovation. Prof. Larry Leifer is Professor of Mechanical Engineering and Director of the Center for Design Research at Stanford University (http://cdr.stanford.edu/). He is also one of the co-founders of Hasso Plattner Institute of Design at Stanford (http://dschool.stanford.edu/). Larry and his team are dedicated to facilitating individual creativity, understanding the team design process, and developing advanced tools and methods that promote superior design and manufacturing of products. Dr. David Nordfors is Founding Executive Director of the Center for Innovation and Communication at Stanford University (http://injo.stanford.edu/), which among other things look at how journalism and other communication influences innovation, how innovation influences journalism and other communication, and the ability of journalism and other communication to recognize and cover innovation. It involves looking at the connections between communication, formation of shared language, and innovation capacity.